Posted on July 30, 2015 by Barry V.
After reading the orientation panel at the Cook’s Canyon Wildlife Sanctuary parking area, I decide to check out the old Town Pound, only a few hundred feet further down South Street. I’ve explored other historic pounds in Massachusetts, but this one strikes me as being particularly well preserved. 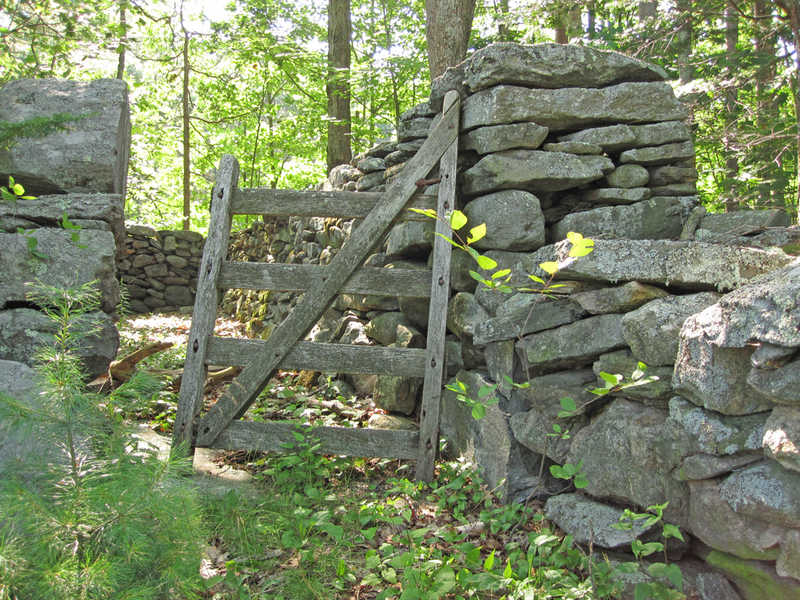 The high stone walls are still straight and true, and even the old oak gate is in good condition, despite hanging off its hinges. Along the first segment of the Cook’s Canyon Trail, I spot an attractive colony of Clintonia, with its small clusters of bright blue berries atop spindly stalks. The bright green, slightly glossy leaves form a strong pattern viewed from above, set off by pine needles and a large piece of pine bark partially hidden by the leaves. 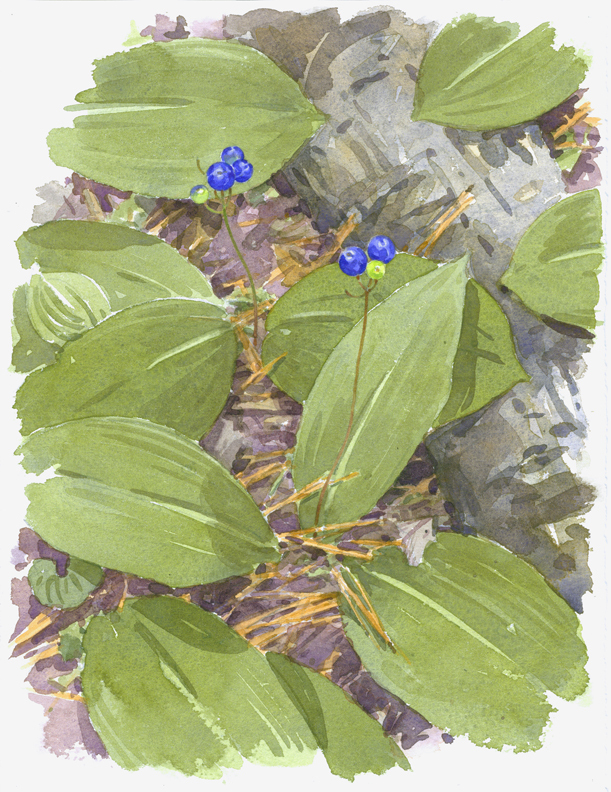 It’s pretty obvious from my painting why this plant is often referred to as “bluebead lily”. I paint in the berries last – I know they’ll make little explosions of color that will bring the watercolor to life! Further along the trail I read an interpretive panel about dam removals. A small dam across Galloway Brook was removed here about 8 years ago, restoring the brook to it’s free-flowing state. Ebony jewelwings flit around the brook, perching on swamp milkweed in full bloom. From what I can see, I’d say the dam removal was a complete success! 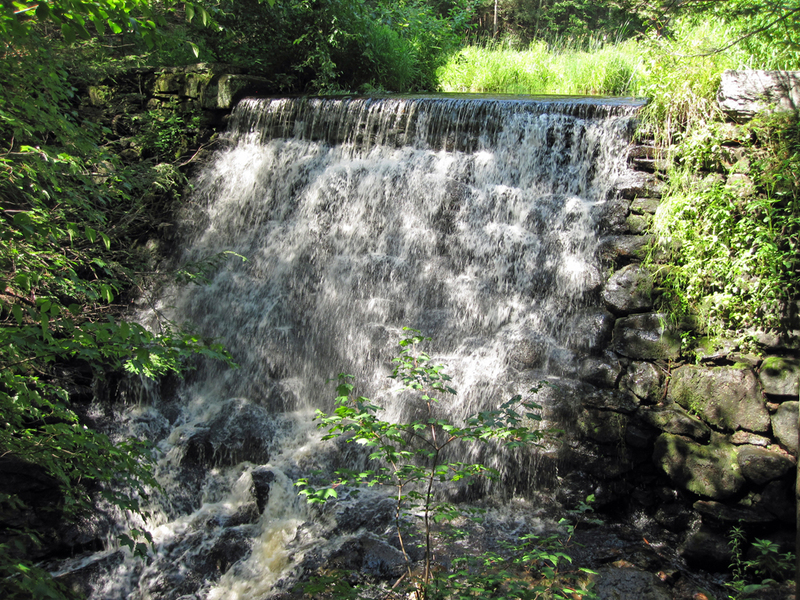 The second, larger dam on the brook is the main destination for most visitors, since it becomes the site of an impressive waterfall when there’s enough water in the brook. And it was flowing strongly today, due to the heavy rains of yesterday! 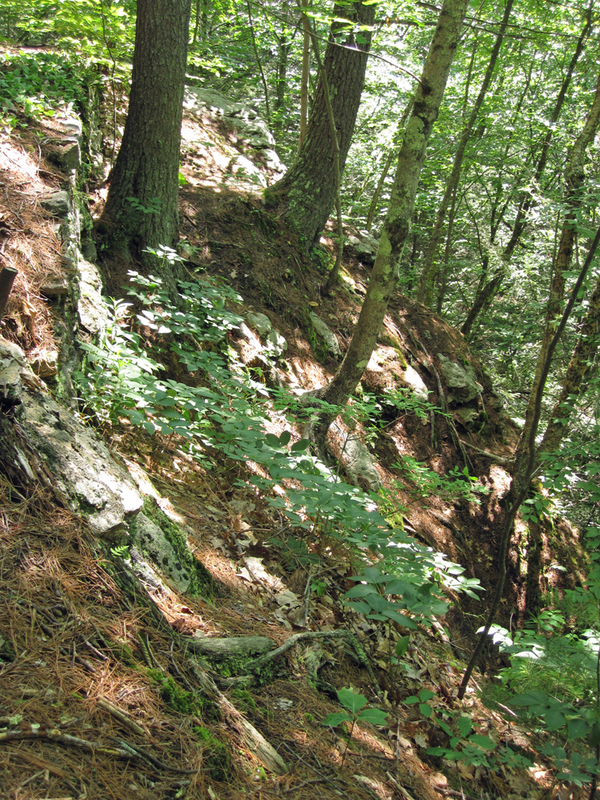 Below the waterfall, the brook tumbles down a narrow gorge – the “Canyon”. I’m impressed with the way the trees cling to the steep slope, and set-up to paint a view of the north wall of the canyon from a narrow trail that skirts along the top edge. There’s barely room to set up my pack chair, with a steep drop-off immediately to my right. I feel a little guilty to be blocking this little section of trail, and apologize to a couple who graciously agree to detour. I usually do a lot of editing to a forest scene like this. There’s a lot more detail than I could possibly paint in on location, and much of the detail would clutter the scene anyway. 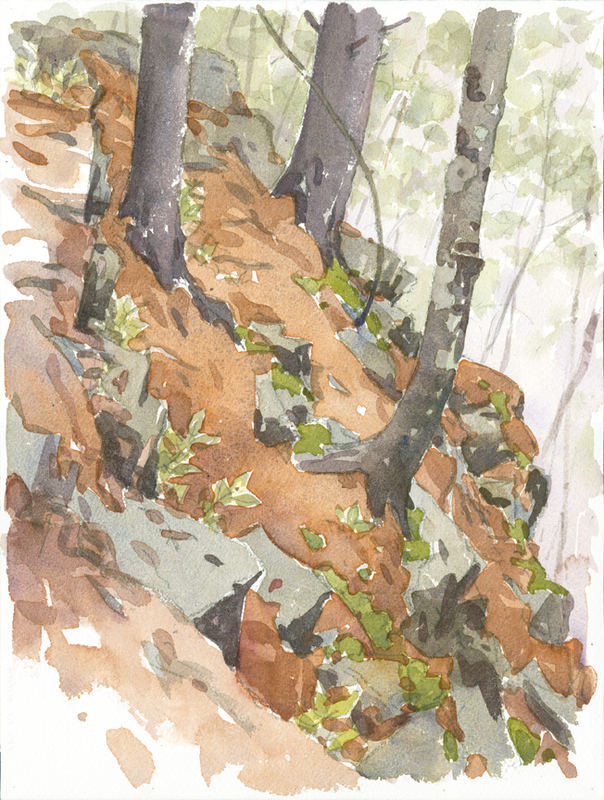 If you want to see just how much I leave out, take a look at this photo of the scene and compare it with my finished watercolor. Returning on the Galloway Brook Trail, I hear at least three ravens yelling back and forth and circling above the trees. It appears to be a family group, and I pondered whether they might have nested somewhere on the canyon walls. Growing right along the brook is a delicate, airy vine with leaflets of three and thread-like stems curving and twisting up onto the tops of other streamside plants. This is hog peanut, a relative of the more common ground nut. I enjoy doing a study in my sketchbook, letting the lines wander (like the plant tendrils) around the page in a spontaneous manner. 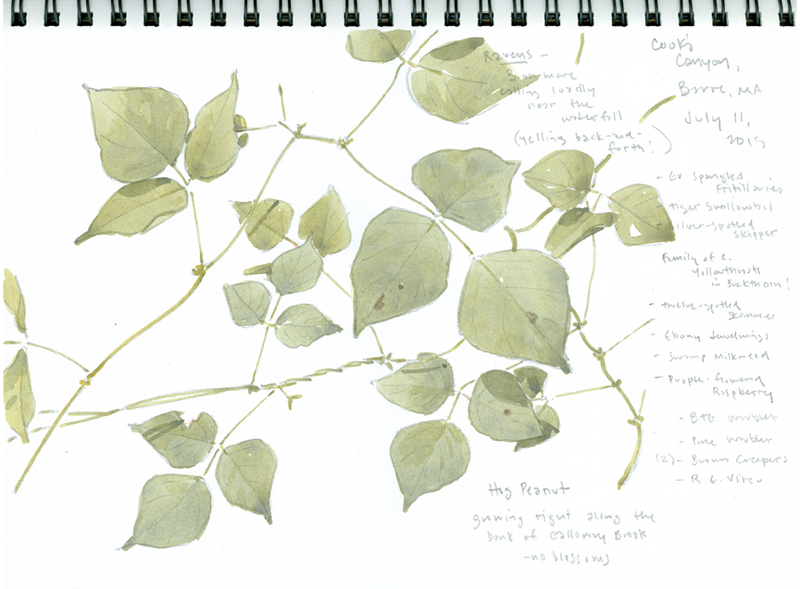 This entry was posted in Artists, Barry Van Dusen Residency, Museum, News and tagged Barry Van Dusen, Bluebead lily, Cooks Canyon, Cooks Canyon Wildlife Sanctuary, Ebony jewelwings, Galloway Brook Trail, Hog peanut, Landscape, Ravens, Sketchbook, Swamp Milkweed, Watercolor, waterfall, Wildlife Sanctuary on July 30, 2015 by Barry V..